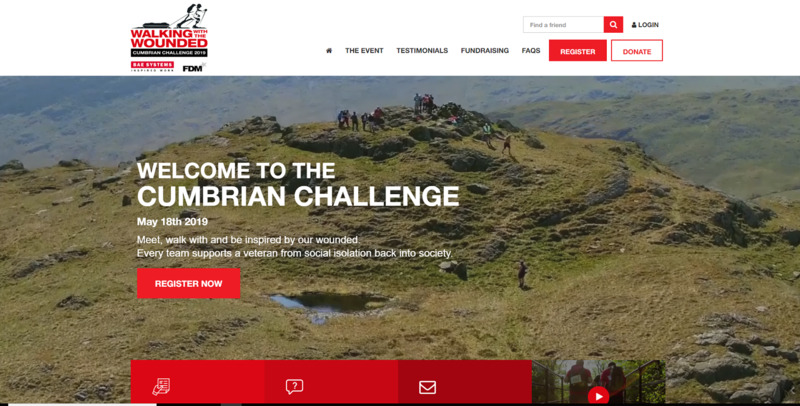 Registrations for Walking With The Wounded's flagship annual event, the Cumbrian Challenge, are now open for May 2019 - via a brand new website. Now in its seventh year, the event in Grasmere in the heart of the Lake District has seen more than 700 teams take part, raising more than £1 million to support those who served. For 2019, teams of three or four can take on one of three fun and challenging routes around the Langdale Pikes alongside teams of veterans being supported by the charity. Dale Eades took part for the first time last May with a team from Morson Group. He said: "I found it breathtaking, heartbreaking and inspiring meeting and hearing the stories of the guys - it made the fundraising efforts worthwhile. I personally enjoyed how our team bonded in these adverse conditions, we all work in separate departments and are now good friends". The event, supported by FDM Group and BAE Systems, features 150 corporate, military and individual teams - with each team fundraising in advance to support a veteran from social isolation back into society. Teams who sign up before 30 November can benefit from an early bird offer. Find out more, see the video or read testimonials at www.cumbrianchallenge.org.